A former Pakistan government minister on the increasingly severe situation in Balochistan. Sanaullah Baloch comes from the Kharan district of Balochistan. In the 1997 Pakistan general elections, he was elected as the youngest member of National Assembly in the country’s history, at the age of just 26. He subsequently served as parliamentary secretary for the Interior and Narcotics. Baloch was elected senator from Balochistan in 2003, resigning from the Senate of 2008. Today, he is working with UNDP and helping African countries develop their constitutions. Baloch also writes regularly for leading English dailies. The Balochistan Point recently spoke with him. You are a senior constitutional advisor of UNDP. Can you tell us more about what that entails? Since most Baloch representatives have been forced to live in exile since 2005 due to the very bloody military operation in Balochistan, I decided not to remain idle when I moved to Norway in 2006. I engaged with several UN agencies and think tanks on governance, democracy, human rights, natural resources and constitutionalism. I served as senior adviser to the Somali Constitution-making support project in 2011 and I am currently Chief Technical Adviser with UNDP, offering strategic guidance to West African countries. The Balochistan National Party (BNP) has been vocal about election rigging in the last general elections. In your experience, was vote rigging against yourself and the BNP organized? Everything in Balochistan is well orchestrated. We knew that the elections were going to be engineered and well managed by the colonial power, Islamabad. They have long-term plans to destroy Balochistan’s social and political fabric to pave the way for the smooth exploitation of, and encroachment on, Baloch land, resources, sea and lives. Personally, I regret taking part in the 2013 Drama, also known as the 2013 elections. We thought the Pakistani establishment had learned its lesson and would allow people to express themselves fairly and freely and accept the people’s verdict. The results of the 2013 elections were not a natural outcome of public opinion – it wasn’t a political and democratic process. Sadly it was part of a decade-long script to further oppress and exploit Balochistan with fake elections, democracy, and morally weak leadership. Pakistan Muslim League (N) leaders often boast that they have given power to Baloch nationalists while having a majority in Balochistan Assembly. Do you agree? There is difference between political empowerment and sham representatives. During British colonial rule in India and Africa, there were always councils and representatives bodies, but people still struggled against colonialism. Gandhi and M.A. Jinnah emerged because a political façade does not translate into political and people empowerment. Balochistan has had a provincial assembly since 2002 but what role has it played in social development, human rights, and conflict resolution? Balochistan is worse off than Afghanistan and African countries in terms of rates of poverty, unemployment, illiteracy, mortality and malnutrition. Also, Islamabad has introduced a new disease: corruption. Currently, Islamabad’s charity and funds are going into the pockets of sham representatives and officials chosen by the establishment. What do you have to say about the 17-month rule of Abdul Malik Baloch as Chief Minister? Recent reports and details of violence, sectarian killings, unemployment, corruption and rising numbers of disappearances and kill-and-dumps are clear indications of his control over Balochistan affairs. Recently there have been calls for a census in Pakistan. What do you think the consequences of a census would be? There is a plan to permanently disfigure Balochistan’s ethnic configuration and favor one ethnic group. This trend was witnessed in the 2013 election when Quetta-Chaghi and many Baloch-dominated constituencies in Quetta were gifted to non-Baloch candidates. To get rid of Balochistan’s historical question, Islamabad is planning to make the Baloch a minority through fake and manipulated census processes. We demand that until and unless the Baloch-Islamabad conflict is addressed – census and mega development projects including the sale of Balochistan’s copper-gold must not take place. Any attempt to play with Balochistan’s demography will result in severe consequences. Afghan immigrants are issued legal documents in Balochistan, as revealed by the confessions of three NADRA employees under investigation. Do you think that this is part of a plan? True, in Chaghi, Quetta, Noshki, Bolan and Sibi districts, special government units are working to register close to one million Afghan refugees. Look closely at Bolan and Sibi district records – there have been hundreds of thousands of fake registrations. In Quetta, at the behest of the government, Eastern and Western bypass lands are given to Afghans to make the Baloch a minority within their homes. Malik and his entourage spent more than two weeks in France in relation to the Reko Diq case. Will Reko Diq be used for the benefit of the people of Balochistan as the government claims? I have discussed this in detail in my article in The News and elsewhere. I have no confidence in the Reko Diq legal team. It comprises people such as Ahmer Bilal Soofi who served under [former Pakistani President Pervez] Musharraf and were part of the caretaker cabinet. They are encouraging and pushing less knowledgeable Balochistan officials and the chief minister to accept an offer from the company that has filed suit in the international court. Again, until and unless the Baloch-Islamabad issue is resolved, Reko Diq must be shelved. Otherwise, under a pretext of conflict, Islamabad will sell Balochistan’s wealth to foreign companies with no benefits for the Baloch and Balochistan. What is your opinion about the Chinese-funded development projects in Balochistan, such as a proposed coal power plant in Gaddani, an oil refinery in the coastal areas of Balochistan, and Gwadar port? Balochistan is witnessing blood and pain on daily basis. Such projects may benefit the Chinese and a few quarters in Islamabad, but there has been no profit from the Chinese presence for the people of Balochistan. They completed the 36-year project of Saindak in just 10 years. The term was extended without legal process for another five years by the Zardari government. Currently they are mining illegally in the Reko Diq area. These major developments, occurring without a social or development plan, are daylight robbery. This naked exploitation has continued since 1952 without any benefit to the Baloch. How do you see the Talibanization of Balochistan? Is this tool being used to weaken the Baloch nationalism movement? This is a classic “strategy” that Islamabad is using to destroy Balochistan’s time-tested social and cultural fabric. If the people of Balochistan, Afghanistan and Pakhtunkhwa were to have peace, education and opportunity, who is going to buy third-rate products from Punjab, Gujrat, Gujranwala, or Faisalabad? We are forced to send our kids to madrassa and see our resources benefit the elite province kids who enjoy top-flight educations. What is the Balochistan problem specifically? What, in your opinion, is the best possible course of action for solving the Balochistan problem in a way that would be agreeable to all stakeholders? The Balochistan question involves political, economic, administrative, and (importantly) security elements. All of these areas are controlled by Islamabad and their planned mismanagement has led to the current state of affairs. No government has the courage to solve the Balochistan question. 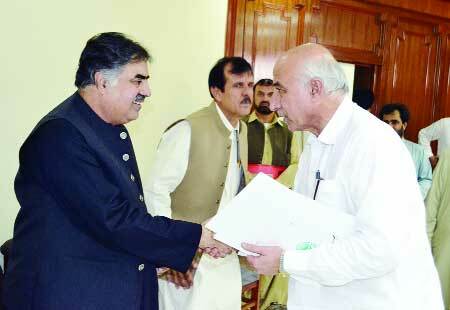 The key to peace in Balochistan is in the hands of the establishment. If they are not willing to see peace, then no plan or policy can succeed. It is waste of time and resources to rely on weak political institutions to resolve very complex conflicts. The Balochistan issue crosses borders. It is also linked with regional geopolitical challenges and more importantly with Afghanistan.